Why pay many times more for this material than necessary?? Our rough comes directly from Russia as well as the United States and is being faceted either abroad or in the United States. We cut for calibration as well as freeforms or any size and shape desired. The cutting is the best that can be obtained. This material is a true synthetic and has a wonderful color change from bluish green to amethyst purple (and slight variations) - just like the finest natural material coming from Brazil. Unlike the natural material, our Synthetic Alexandrite is well cut, properly proportioned, clean, has a wonderful color change and is always consistent when ordered. 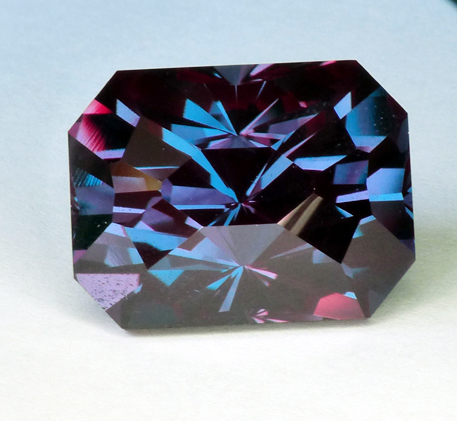 The lab Alexandrite from the United States is grown for laser applications. This material is not as saturated as the Russian material and very larger gemstones can be faceted without being overly dark. The Russian material becomes too dark is sizes over 7mm. 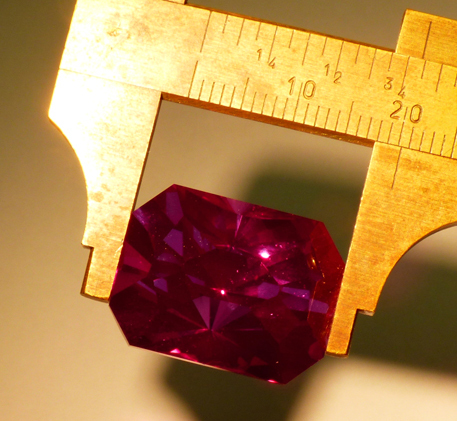 We have faceted 50+ct gemstones from the laser rod material and it has never been dark! NOTE: Our material is produced using the Czochralski Pull Method. The retail on the faceted material is $360 per carat - offered by a major supplier of castings and calibrated gemstones for the trade. Before comparing prices, understand the differences in production, simulated stones and therefore costs involved. Why purchase Synthetic Alexandrite from All That Glitters?? In general, our Synthetic Alexandrite pricing is approximately 50% to 75+% off (depends on the growth method - Russian vs. U.S. Lab Grown) the expected prices offered to the Retail Public based on a major supplier to the public ($500/ct). Our pricing is typically $20-$250/ct depending on the size, shape, cutting and method of growth. 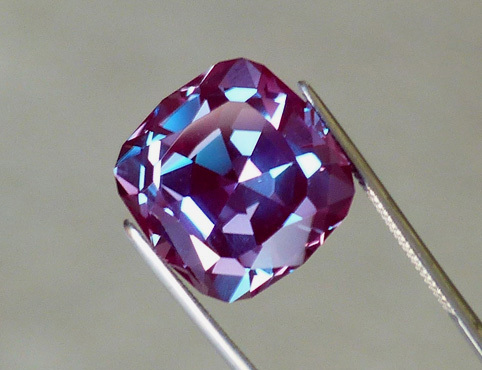 Laboratory Grown Alexandrite - U.S.
One may see Synthetic Alexandrite on the market; unfortunately if the price is too low, it will usually test out as Synthetic Corundum(Sapphire). Those who sell Synthetic Corundum as Synthetic Alexandrite do so illegally and do this because of the cost differential and the fact that most customers will never have their gemstone tested. The cost of the Syn Sapphire is VERY inexpensive compared to true Syn Alex. The Synthetic Alexandrite below is fairly exclusive to All That Glitters, as this gem material is an off-shoot of the creation of laser rods for military applications. This material has less saturation than some of the other material produced out there (All That Glitters has this material too! ), and allows a very large gemstone to be faceted without being overly dark. Our prices on this material are very low since we purchase it directly from the lab and we have our own cutters too! Alexandrite is a very photo-reactive gemstone making photography difficult as the true colors that the eye sees, are not what is captured by the camera. This material is usually a purple under fluorescent lights, bright pinkish red under incandescent, and outside with one's back towards the sun, the gem will typically be green to blue green. Most of the time there is a bleed-through of colors, so a gemstone will have a number of colors seen by the observer, especially as the gemstone is turned and the different axes and facets interact with the available light source. In some of these gems, one can see purple, pink, peach, blue, green, etc. The photos do not do these gemstones justice. It is best to view these gems in person (actually, it is always adviseable to view gemstones directly as photos can never capture the internal life or reflections of a gem!). We do have a 7 day guarantee, so if you do not like your gemstone for any reason, it can simply be returned. Tipping it just right will also give a yellowish green and purple; have seen pure green too. Simply Amazing Material! 1.) 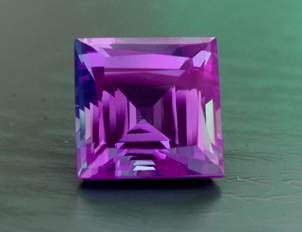 First photo shows the gemstone by a window in diffused light - body color is purple with teal highlights reflecting off the internal facets. Our camera captured more bright blue, but the color is more of a teal. In different window lighting, we have seen this teal be more green. 2.) Middle photo was under our office fluorescent lights - shows a body color of purple with a glowing blue off the internal facets. These colors remind us of some of the fine bluish Amethyst that is available on the market. Look through the very center, the table facet, and in the back in two sections, one can see a more green color. 3.) Bottom photo is under incandescent light. It literally glows a bright pink with red flashes. 4.) We have viewed this gemstone under indoor flood lights and the body color seems to take on more of an orangy pink or perhaps orangy purple. We may have multiple pieces in these sizes picturesd. If you require pairs, feel free to ask! 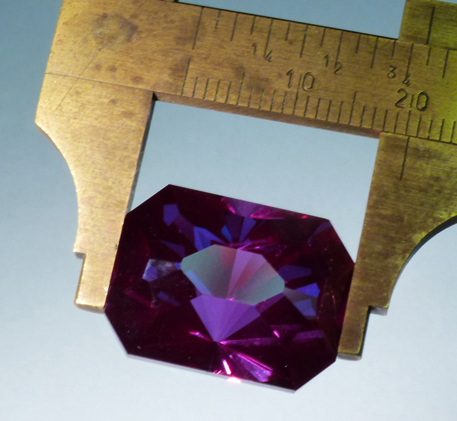 This true synthetic Alexandrite is from the manufacture of laser rods. We have obtained some of this material over the years. It changes from a purple to a greenish blue color depending on the available light. It also shows highlights or orange and yellow. We faceted this material in our All That Glitters Exclusive Elegante Cut, designed by the owner of All That Glitters a few years back. It returns a very large proportion of the available light and has a very unique shape. The only place this unique faceting design can be obtained is through All That Glitters. Though a wonderful cut, we have not faceted many pieces as of yet, as the rough dictates the shape of the finished gem and unless the shape lends itself to our cut, we will use another design. You may see another two natural gemstones that have been faceted in the Elegante or Modified Elegante on one of our Tourmaline pages. Princess Cuts! Everyone loves this style/design in Diamond; a great shape for a man or woman! 8mm - $369 (lasersun-10h) Only 1 available! 10mm - $761 (lasersun-10f) Only 1 available! Rounds - the most popular shape in most gemstones and may not always be available in lab grown or natural gemstones. 8mm - $330 (lasersun-10c) SOLD OUT! 10mm - $625 (lasersun-10a) Only 1 available. "My package arrived safe and sound yesterday. Thank you so much, I couldn't be happier with the alexandrite from the laser rods. The color change is amazing. I had bought some earrings that were supposedly alexandrite from somewhere else and I now know it obviously wasn't alexandrite and they were a similar price to what I paid you for something half the size. I can't wait to turn these rounds into earrings." 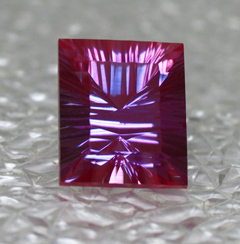 17.25ct Square Synthetic Alexandrite (laser-07-03b) $1,035 - ONLY $60/ct! 3 cabs totalling 74cts of Synthetic Alexandrite. 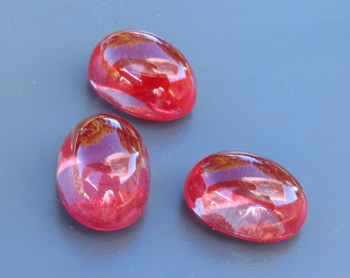 These are the only cabs that we have ever cut and we have never seen any other companys cut cabochons in this gemstone. These are fairly large and would make an interesting mans or womans ring, as well as a pendant or pin. 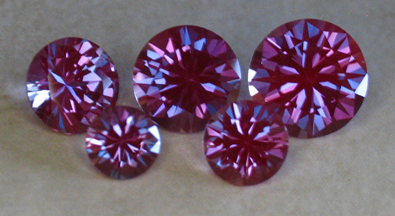 Three recently faceted Synthetic Alexandrites weighing a total of 42.87cts. This material was faceted from our laser rod material. Synthetic Alexndrite sells to the trade from one company at $167 per carat, with a retail of $500 per carat. This is usually the material that we also have from Russian which has a higher Chromium content, but with the high Cr material, we cannot facet large gems like this as the gemstones will be too dark. This particular material was manufactured for laser rods. In the above photo, the center gemstone is a 15x11mm oval weighing 10.38cts; the two ovals on either side are matched and measure 18x13mm. They weigh 16.36cts and 16.18cts. Since these are large, the price has been discounted to $70 per carat. If purchasing more than one, the price per carat is only $60. 11.31ct U.S. Faceted Synthetic Alexandrite - Faceted from rough destined for a Laser Rod! Color Change is from a Pinkish Red to a Purplish, Purplish with Teal or Teal depending on the wavelengths available in the light source. Under diffused daylight, a nice green can be seen also. 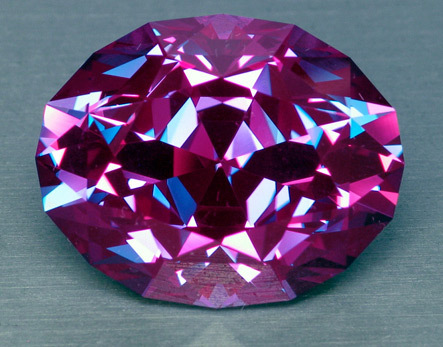 This has a number of pluses - it is Synthetic Alex(NOT color changing sapphire which sells for a fraction of the price of the lab grown synthetic alex), it has a unique origin, is U.S. faceted, and a low price. The cost of good U.S. Cutting wouldn't even pay some to facet this stone for what we are asking. This gem is not overly dark as some Syn Alex can be because it has less Chromium and saturation is not a problem in very large sizes. The photo above is not the best photo, as it can appear more teal and even green. 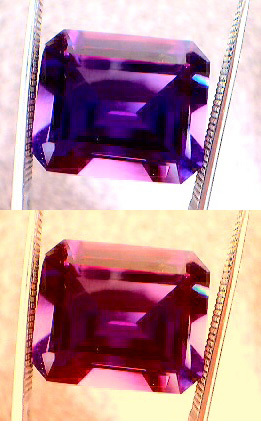 Photographing color change or color shifting gemstone is very difficult. 11.15ct Square Dozen Cut Synthetic Alexandrite (Laser Rod) - U.S. Faceted! 14.94ct Synthetic Alexandrite - Laser Rod Material!!!! This material is manufactured in the United States for use as laser rods but is still gemstone/jewelry quality. The color change of the above stone is a vivid pink red under incandescent lights. Under fluorescent, it is a mix of red, purple and teal. Under certain fluorescent lights, you will see more of the teal with some of the red or purple as an undertone. Photographing the stone under fluorescent lights was difficult compared to incandescent light. (laser-02) $896 ONLY $60/ct! 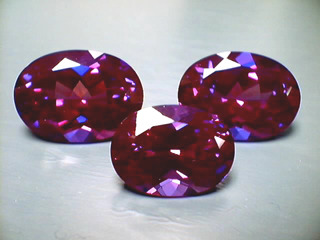 These are larger gemstones than are usually found in synthetic alexandrite. Because of their size, they are deeper colored stones. Under incandescent, the color is purple to reddish purple. Under fluorescent lights, they are a dark teal (greenish blue). It is very difficult to obtain good photos of the teal. In many lights you can see both of these colors within the stone at the same time. The retail price from one of the leading sellers of this material in the US is $360 per carat. This price per carat also reflects stones much smaller than those above. Our prices on the above material is $200-250 per carat. We have heard that our color change may be slightly better than their material; obviously, since the two large gemstones were faceted int the U.S., you are guaranteed wonderful cutting. 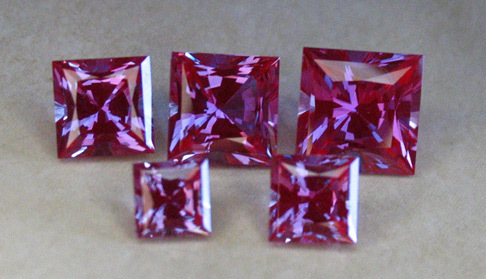 These were cut on an individual basis; most of this type of material is faceted in bulk outside of the U.S. and may show this fact to those who understand cutting. In fact, even most natural gemstones are faceted in the country of origin and end up being poorly cut. We attempt to purchase all of our gemstones in the rough so we can use our cutters to facet wonderful material that we are proud of. 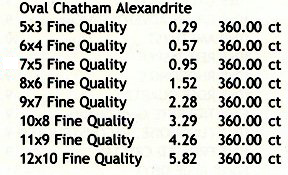 If you have wanted an alexandrite or a synthetic alexandrite, the above stones are priced to sell! All That Glitters Price price is ONLY $250/ct! A savings of $250 per carat off the typical retail price! We have this material in 4mm, 5mm, 6x4mm and 7x5mm!! "JWe love it! The color change looks terrific! Thank you so much, we'll send you a picture after we get it set." "I have enjoyed browsing your website at length over the past couple of days. Your excellent photos make it very tempting to stay there far too long! Some time ago I purchased synthetic alexandrite rough from you and it has worked out well for me." "I gave my wife the bracelet on Wednesday. She loved it. I loved it. The stones are way cool to watch going through their color changes. I asked my jeweler what he thought of them. Originally the salesman said they where nice. When I went to pick up the bracelet the jeweler/owner came out and wanted to know everything. He had never seen anything like them. Even his stone buyer was impressed and wanted them. It is very impressive as you said it would be. You may possibly hear from the jewelers soon. Anyway, thanks again, my wife who is a jeweler also was very impressed. I'm glad I found you." "Received the stones today, they are beautiful...Thanks so much!" 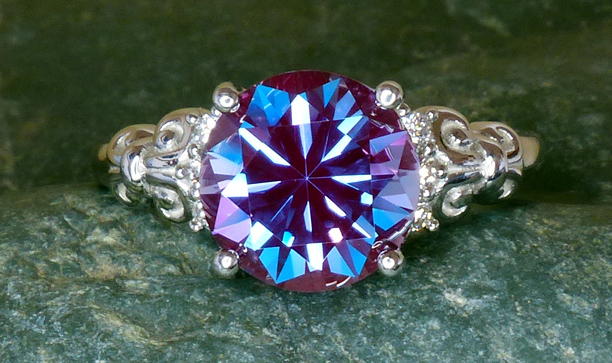 "The alexandrite arrived today. It is superb! I am really looking forward to faceting it and studying it as an optical phenomenon. I guess you have seen my articles on this subject."